Cats may skulk, and cats may fall – but no matter what they do, cats must obey the laws of physics. Scientists have tried repeatedly to figure out how they manage to do it. At the extreme, physicists analysed what happens to a dropped cat. That's a cat in free-fall, a cat hurtling earthwards with nothing but kitty cunning to keep it from crashing. 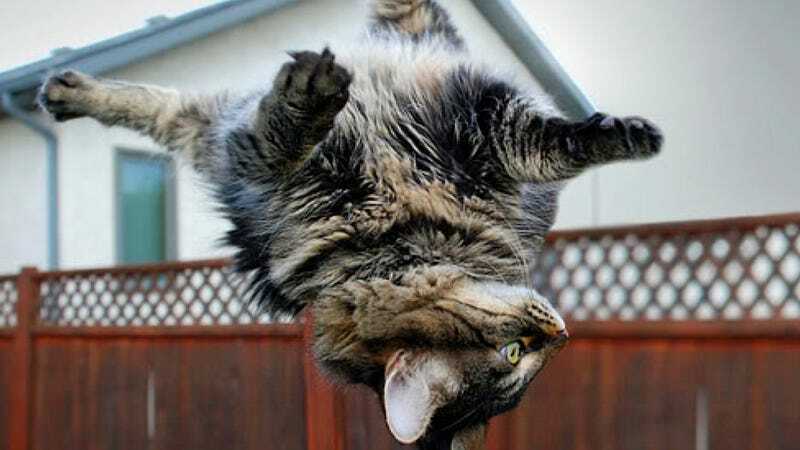 "It is well known that falling cats usually land on their feet and, moreover, that they can manage to do so even if released from complete rest while upside-down … numerous attempts have been made to discover a relatively simple mechanical system whose motion, when proceeding in accordance with the laws of dynamics, possesses the salient features of the motion of the falling cat. The present paper constitutes such an attempt." Abrahams says that Kane and Scher's foray into kitty physics was just the first of many. And fortunately for us, he's gone and picked out three such studies (with links to the original papers) for us to look at in greater detail. Check it out over at The Guardian.